This Memorial Day weekend, I knew I wanted to tackle at least one organization project. So in between grilling out and Arrested Development Season 4 episodes, I tore apart the second bedroom and Bob's file cabinet to lend a little filing his way. 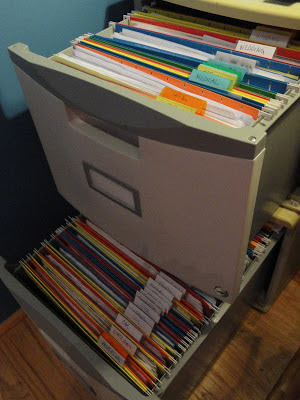 Years ago I created a filing system for myself with colored hanging folders and a double stack of plastic file cabinets from Office Max. (here's a post about getting that back in shape after a few years of neglect.) I never really needed the second one though, so after moving in with the boy it became home to his documents. To his credit, there were manila folders within his hanging folders for many of his areas (ie. taxes, family stuff, utilities), but the cabinet ended up getting so stuffed that we had nowhere to put any new papers that came his way. So, with his permission, I dove into the cabinet and a few additional stacks that had built up over the months and spent the last two days organizing Bob, 2003-2013. I forgot to take a before picture of the super full file cabinet, but here's a shot after I unloaded everything initially. Just a couple hours later, individual piles for each subject area had begun to spring up all around the room. After making an assessment of all categories and what we could combine, a quick trip to Target loaded us up on new file folders to help finish the job and make it match it's top twin. I wished the new folders had colored name tags like my first set had, but alas, it was clear all the way. In the end, we shredded a lot, combined some areas (my electric bills + his electric bills = our electric bills), and took a few trips down memory lane. With the organizing bug in full force, I finally took a good look at the accordion filer that I keep scrap paper, stickers and crafty goodness in. I decided to go in a different direction and use up a few of the blue boxes leftover from my wedding centerpieces. Christmas stuff went in one box, odds and ends like felt flowers, bits of paper and googly eyes ended up in another, and "kidstuff" was a catch all for stickers and pieces that were great for niece projects and cards for kids. A much thinner plastic folder is now being used to hold things that were more in the 8 1/2 x 11 category and wouldn't fit in a blue box. These fit nicely on the closet shelf alongside the plastic carriers of 12 x 12 scrapbook paper. Without a label maker to my name, glittery stickers left over from my Every Holiday Blocks proved useful to label the boxes. Cleaning out the second bedroom also meant organizing underneath the computer desk - we had no less than three old laptops stacked up with various cords strewn about. Time to set those aside for a trip to the Best Buy in the sky....It's finally a clear space for our feet!